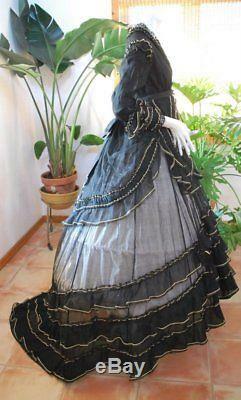 Impressive and fancy Civil War era ballgown dating to the 1860s. Full length gown with long ruffle train, fancy trimming on sleeves and front of the bodice, with elaborate apron with bows and ruching, bodice lined in fine black silk, breaks and shattering to this silk in the sleeves. In excellent overall antique condition, museum deacession, with couple breaks to the net back of the bodice, some fragile ness around the hook and eye closures. Chest measures 34 waist approx. 24" length from shoulders in front 55" with train 73. KEEP IN MIND ANTIQUE AND VINTAGE ITEMS DO NOT HAVE SIZE/FABRIC CONTENT LABELS. CONDITION DESCRIPTION IN ALL LISTINGS. PLEASE ASK ALL QUESTIONS BEFORE BECAUSE ALL SALES ARE FINAL! The item "1860 CIVIL WAR ERA DRAMATIC RECEPTION GOWN BLACK NET WITH FANCY EMBELLISHMENTS" is in sale since Tuesday, November 20, 2018. This item is in the category "Clothing, Shoes & Accessories\Vintage\Women's Vintage Clothing\Dresses".